And it’s not just that people who work also go to the grocery store, restaurants, or friends’ homes. Lots of people don’t work at all, and those people – largely students, the elderly, or people with disabilities – are disproportionately likely to use transit for all or almost all of their trips. Finally, plenty of people who do work might drive three or four days a week and take transit the other one or two. But since the Census only asks about what they do most of the time, they’ll show up as “drivers.” All of these things will tend to undercount a place’s reliance on public transit. Hertz has put together a great infographic using Census data to emphasize the point. 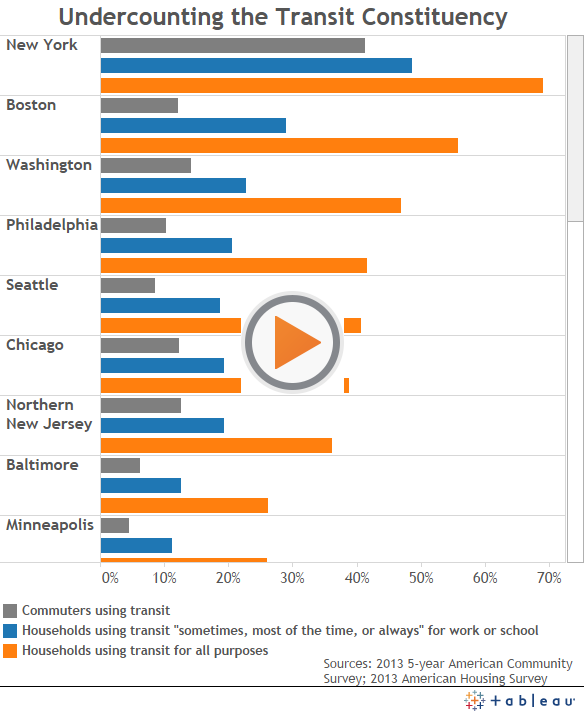 Gray bars show metro area residents who rely primarily on transit for commuting; blue bars show those who use it "sometimes" or "most of the time" in addition to "always"; orange bars show those who use transit for all purposes—including non-work trips. The common theme to all 25 metros is that people use transit a lot more than their commutes alone would suggest. The upshot here is that cities need transit systems that run frequently and reliably at all times of the day and on all days of the week. Trains and buses that run well Monday through Friday at rush-hour are great for typical commuters. But all-day service accommodates these folks as well as the unemployed, and the retired, and shift workers, and people who mix their mode choices throughout the work week. It's also much more cost-efficient for agencies. No wonder it's on the rise. There are still significant barriers to wider all-day transit adoption. Jarrett Walker outlined some of them for our Future of Transportation series last year; most notably, it requires a change in mindset among agencies (especially commuter rail operators). Another big barrier is the white-collar work lens: since many powerful professionals abide typical rush-hour schedules—especially politicians—they tend to think the commute trip is the only game in town. If that were ever the case, it certainly isn't anymore.